Pokémon is a franchise that must be doing something right. Since its original release, it's maintained large sections of its fan base and continued to create new poke-addicts. Now, in its sixth generation, the Game Freak development team have been tasked with creating an updated and fresh approach to the ongoing series. Rather than wholesale changes, they've opted to revamp the presentation, refine many mechanics, and introduce new features. X and Y is a familiar journey through the established formula. The turn-based battles at the heart of gameplay is much the same as always; deep and variable. While it sticks firmly to its roots, Pokémon X and Y proves to be a much wanted refinement. Players set out to become the greatest Pokémon Trainer, this time in the France-inspired Kalos region. To achieve this goal they journey across the huge region, armed with a starter monster and a pokédex. Goals are simple - find monsters, capture monsters, raise monsters, battle monsters. Four friends and rivals, each with their own goals, join you from time to time. When reunited, they test your progress in different ways. Serena (or Calem) constantly wants to test her (or his) might against you, Trevor challenges you to compare pokédex, Shauna shares unique experiences with you, and Tierno just wants to find pokémon to dance with. You also meet people in towns, cities, and the routes you travel. Although many fight you on sight, it's a world where almost everyone is friendly. They don't mind you wandering uninvited into their homes, they'll often give you hints, tips and items rather than show you the door. Even the games antagonists, Team Flare, aren't hugely menacing, just misguided in their efforts to create a better world. The emphasis on exploration and facing challenges is well served by the updated visuals. The flat 2D presentation of previous games has been completely abandoned in favour of stylish new 3D designs. Talos is a stunning land to explore, featuring eye-popping forests, mountains, deserts and snowlands. Some interior designs are incredibly imaginative too, particularly those of the eight gyms you visit. The world is huge, especially if you take time to explore the surroundings. From beginning to end of the main story, the journey takes time. In an effort to alleviate some of the burden of traipsing from place to place, various ways to get around have been introduced. Within the first hour you have a pair of roller-skates; a fun addition that utilises the updated directional movement (it also allows rail grinds in certain places). The bike returns, given by simply walking into the bike shop. Large pokémon provide mounts that get players across impassable terrain. Fly and Surf abilities are unlocked mid-game. Combat animations are impressive. Still alluding to combat, rather than showing two monsters pounding on each other, the colourful variety of moves are a lot more visually engaging than in previous titles. New monsters are found in abundance, each created with the new style in mind. Old favourites from previous generations like Squirtle and Charmander return for a 3D overhaul, making them look better than ever. New monster-type, Fairy, is an exciting inclusion. They're tough to beat, and great additions for tactical players. Fairy-types use a wide variety of defensive buffs and status inflictions. They're also incredibly effective against dragons. Often a strong fairy ability can one-hit KO the formally overpowered winged beasts. 'Mega Evolutions' is an ability granted about halfway through the journey. Considered the greatest secret of Talos, learning about them is a significant part of your quest. With Mega Evolution certain monsters temporarily go beyond the last stage of their evolution. Despite being presented as a difficult ability to master, it's really just a new option to select in battle once certain requirements are met. 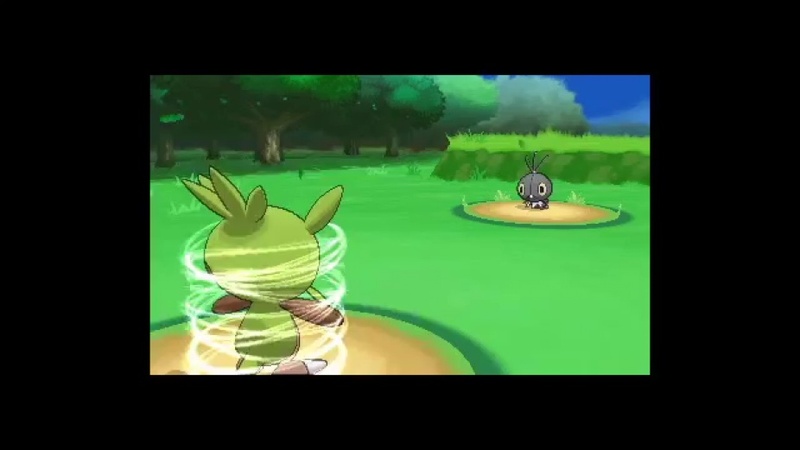 It's a welcome feature though; not only do mega evolved pokémon look impressive, but can also change battles. Charizard's mega-evolution changes it from Flying-type to Dragon-type, altering it's strengths and weaknesses. Horde Battles, where players fight five low-level pokémon at once, and Sky-Battles, where players can only use flying pokémon, slightly diversify combat. Horde battles can be fun and, depending on your roster, quite challenging. Once figured out though, much of the challenge dissipates. Sky battles are interesting because they limit the pokémon you can use, so no spamming lightning attacks (unless your flying-type happens to have that ability). Unfortunately, Sky-Battles are few and far in-between. Perhaps because it's main audience is children, a lot of the in-game combat lacks challenge. Victory can be frustratingly simple despite the intricacies afforded by the mechanics. AI challengers repeatedly try ineffective moves and seem completely oblivious about protecting from elemental weaknesses. Time and time again they open themselves to defeat through simple repetition of effective moves. With combat rarely difficult, in-game challenges become about catching rare monsters, assembling a perfect team, and boosting stats. More competitive combat is available in online multiplayer. The PSS (Player Search System) is the best way to trade and battle Pokémon with friends yet. The option is almost always available on the 3DS' bottom screen. It shows friends who are online, people that you've interacted with, and passers-by - other players nearby that your 3DS has noticed. Selecting players from the PSS sends them a notification that you want to trade or to fight, allowing them to save their game and prepare themselves before responding to your request. The bottom screen is also where mini-games are accessed. Pokémon-amie is similar to a virtual pet. Using the touch-screen, you develop the relationship with your pokémon. You pet them, feed them, and play games to develop your relationship. Monsters with high affection for their owners perform better in battle - they land more critical hits, recover from status afflictions quicker, and dodge more attacks. Despite the advantages, Pokémon-amie quickly becomes a chore. The mini-games (heading balls of yarn, picking seeds, picture puzzles) get tiresome very quickly. Super Training, also reached through the bottom screen, features mini-games that boost pokémon stats. After selecting a monster to train, you can use the touch-pad to have them shoot at targets on giant inflatables. Do well and a punch-bag is the reward, which allow quicker development of stats through frantic tapping, or just leaving them dangling in front of a pokémon while you walk. Like Pokémon-amie, Super training mini-games become a tiresome distraction far to quickly. Story is not the strongest aspect of the game, reasons for actions often boil down to 'just because'. Despite that, X and Y is littered with quirky humour, and though never getting too deep, touches on bold themes of mass-destruction, selective preservation, and regret. That sounds gloomy, but the importance of friendship, confronting challenges, and helping others, are the messages hammered home. Game Freak have created a delightful world to explore. There's so much content that even after completing the story there's still plenty to do. The turn-based combat, and opponent AI could still use some updating, but new features, and engaging visuals show great strides forwards. X and Y will be looked on very fondly in years to come. I don't doubt that the sixth generation will delight young players, and a number of grown-ups too.